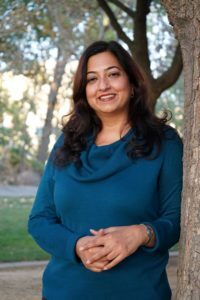 Kanchan is a licensed Marriage and Family therapist with a practice aimed at creating a safe, caring and confidential environment, allowing for deep reflection on the self and on relationships, which serve as a catalyst for healing and change. As a holistic psychotherapist, Kanchan attends to various aspects of the person, including the intellectual, emotional, spiritual, creative and physiological. She has had in-depth trainings in Expressive Arts Therapy, Somatic Experiencing, Mindfulness Based Stress Reduction, and the Developmental Model of Couple Therapy. This enables her to offer and teach couples a wide range of tools and techniques as they navigate challenges such as differences in values, beliefs, and communication styles as well as the effects of trauma, anxiety and depression that arise in their relationship. Additionally, Kanchan is culturally sensitive and enjoys providing therapeutic services to inter-racial couples, immigrants, children of immigrant parents and people across the gender and sexuality spectrums. Our group of expert therapists specializes in counseling services for couples and individuals throughout the San Francisco Bay Area, select cities in El Dorado County, and online. We help couples overcome difficulties and evolve as individuals and as a team; increasing understanding and love. © 2018 – 2019 The Couples Institute Counseling Services, A Marriage and Family Therapist Corporation. All rights reserved. You may not reproduce or use any of the text, images or other content appearing on this page or website, nor may you use any of the trademarks, without written permission from The Couples Institute Counseling Services, A Marriage and Family Therapist Corporation.